At UCEC, we build control panels to most efficiently serve the needs of our customers. That means every control panel we build is different than the last whether we case it in stainless steel to withstand the rigors of a pharmaceutical environment or we custom build a panel with multiple motor controls and relays to perform complex conveying functions. Despite this, there are some elements that make every control panel similar. In this article, we detail the most common components found in electrical control panels and the traditional best practices of control panel layout. In today's connected world, everything communicates with everything else and panels are no exception. 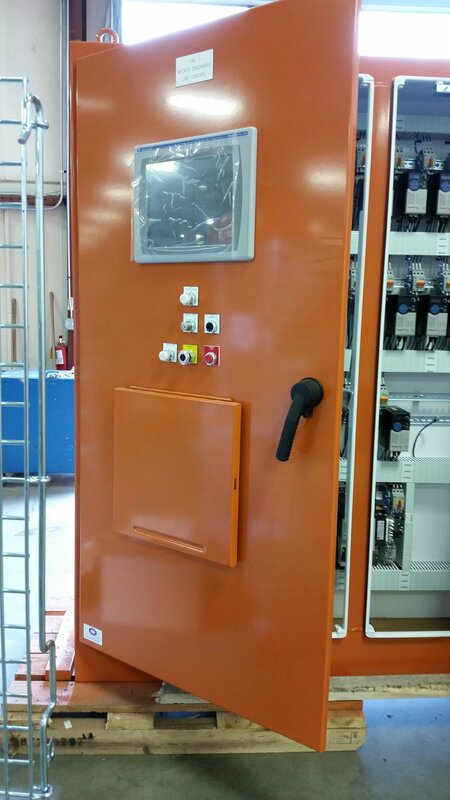 Control cabinets, or control panels, all have a set of components that allow them to communicate with other equipment, technology and to their human operators. The first component all control panels have is a type of controller. This allows operators to interact and manage the functions in the panel. The controller installed in the panel depends on the complexity of the process the panel is controlling. For most processes, panels are equipped with a programmable logic controller (PLC). What is a PLC in a Control Panel? A PLC takes a series of inputs, such as proximity sensors, level sensors, and speed sensors, and uses this information to control its outputs. These outputs can be motors, valves, alarms, and other user defined components. What is an HMI in a Control Panel? For a panel that may have frequent operator interaction a human machine interface (HMI) might be installed. An HMI provides a graphics-based visualization of the industrial control and monitoring system. The visualization the HMI provides allows the operator to easily see how different components are functioning within the specific process the panel is controlling. To enable communication between panels the solution is now much more universal. Ethernet switches are installed in nearly every panel. In the past, DeviceNet, blue hose, and ASI BUS were used. They were replaced with ethernet due to its ease of use, availability, low cost and higher data transfer rates. PLCs, HMIs and ethernet cables provide the basic communication tools every control panel needs to communicate with their human operators and other panels. The next core component in a control panels is motor control. What is Motor Control in a Panel? Most panels exist to oversee some type of motor control. We equip our panels with either a variable frequency drive (VFD) or a contactor and overload set up depending on the complexity of the motor function the panel is controlling. A VFD will allow you to program how the motor operates and give the user control over the speed of the motor. A contactor and overload system is a simple on or off system that provides no further control of the motor. Power supply and protection are two components every panel has so it can function and function safely. The power supply will typically convert 480V or 120V AC to 24V DC as DC is generally regarded as a safer voltage to deal with inside the panel. The other protection measure in every panel is circuit protection to preserve all the expensive and crucial components inside the panel. This is achieved through either circuit breakers or fuses. A line reactor or power filter are two more common components found in most control panels. Again, these deal with controlling and cleaning electricity that are interacting with the panel and its different components to reduce inefficiencies and consume less energy. Beyond these core components of human interface and communication, motor control and power supply and protection the features of each control panel will vary greatly depending on what it’s being designed to do. This creates a seemingly endless way to create and layout a panel. However, there are standards and best practices we adhere to when we approach this task. The layout of a panel depends on many factors. Beyond ensuring our panels meet UL Guidelines and are laid out to the manufacturer’s specifications, we also consider voltage, the end user and the environment where the panel is being installed. When laying out a control panel, the voltage of different components is a chief consideration. We often separate high and low voltage, keeping the 480V separate from the 24V DC power described above. We also keep the communication cables segregated from high voltage. Higher voltage can induce a current into a cable and interfere with the ethernet signal. Depending on the layout of the panel, we might run a shielded ethernet cable to further protect against induced currents, but this isn't necessary in every build. We also try to bring in the high voltage in the upper right side of the panel to further separate the high voltage from the more sensitive panel components. The upper right side is also where we install the main power disconnect. The left-hand side is where we install the lower voltage and more sensitive items like our PLCs and ethernet switches. Most other layout considerations are situational. One of our primary jobs is to make sure the panels are laid out according to manufacturer's specifications and UL Guidelines, but we also take into consideration how our end user is going to be interacting with the panel. Questions we ask ourselves with every panel we're constructing are: How will the end customer be bringing in their cable? How difficult will it be for them to get to certain components and devices? How much room do they need to access different components in case they need to service them? The other common consideration is the environment these panels are going to be installed in. For about half of our panels, we'll install air conditioning to both cool them down and extract humidity from interfering with the components. If it's going outside, we'll make the enclosure completely weatherproof. If it's going inside in a corrosive environment, the materials are changed to withstand those conditions. For example, if the panel is being installed in a pharmaceutical plant where they're constantly sterilizing equipment and washing them down, we'll outfit the panel in stainless steel versus carbon steel due to its higher resistance to corrosion. These are the common components and considerations our craftsmen encounter every day when constructing control panels. Of course, the more custom the build, the more complex these considerations become. That’s why we staff expert craftsmen throughout the process to wire and assemble quality custom control panels for every client. Contact UCEC for all your control panel needs and questions and sign up for more great content below!